So, I not-so-smart(ly)-in-hindsight made the decision to take my family to Disneyland this week. I know we'll have a blast, but going on a trip the week before Christmas (and not getting back until Christmas Eve!) means all my baking, shopping, wrapping, gift-giving, packing, shipping, etc. had to be done by today. It's not. And still here I am on the computer when I have work to do! I'm going to be gone all week, so I'm giving myself a Christmas present and taking some time off. I'll be back next Monday as usual. But, I can't leave my blog with nothing on it, so I'm posting a quick, delicious recipe for you. I will be linking up to some parties- if I can! Join in with me- click here to see the list! These sound great, so I just had to Pin them! This sounds really good! 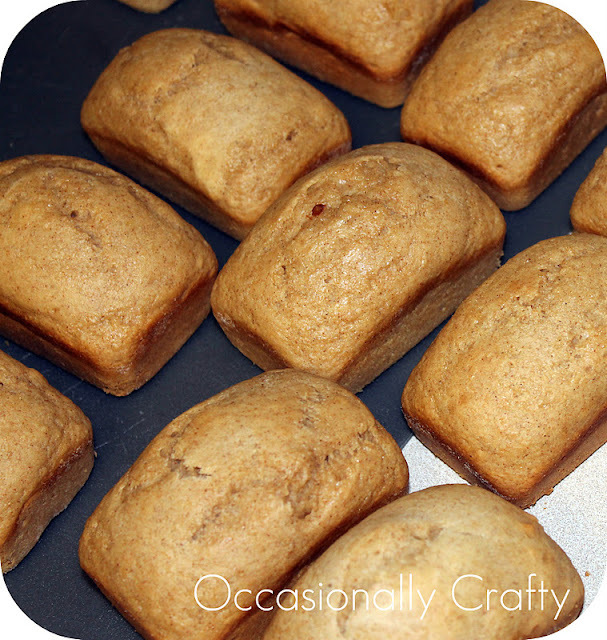 I'm always looking for more quick bread recipes. Thanks so much for sharing! Made these. Amazing. So good, and so quick and easy! thanks for the great recipe. I have lots of applesauce I need to use up. I'm making this in muffin cups. Hope they turn out. not sure how long to bake them. But I'll let you know. So I also added crushed pecans. Made 12 regular muffins. And 12 mini muffins. Mini cooked for 15 min approx. (I forget to press the timer button after putting in the time.) and cooked regular muffins for 10 more minutes. Turned out good. I put the mix in paper cups for the regular size muffins. I'd recommend just grease & flour as they stick to the paper. Could use something. But pretty good! Thanks for the recipe! Audra- thanks for the feedback! I'm glad you tried them. I made this in my bread machine and everyone loved it. Making my second loaf today. Tasted a lot like banana bread. Would be great with nuts! I just made these for some christmas gifts. I replaced the applesauce because I only had homemade apple butter in the house. I think the apple butter really helped the flavor even more. I also used 1/2 cup brown sugar and 1/2 cup stevia to cut down the sugar and used 2 cups whole wheat pastry flour and 1/2 cup whole wheat flour. Also used olive oil instead of vegetable. They came out great. They puffed up perfectly and smelled fantastic. I can't wait to see how my family likes these! Thanks for the feedback! I hope your family enjoyed the bread!